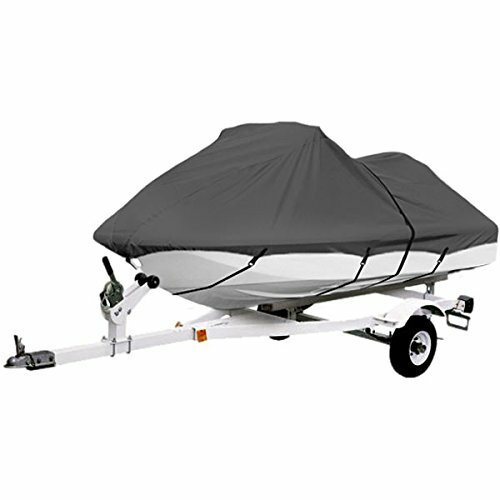 All-season travel cover with an integrated trailering system. Tough polyester Stellex fabric designed for durability and weather protection. Integrated trailering system with built-in quick adjusting side-release straps. Rear air vents reduce inside moisture and wind lofting. Zippered access door on both sides. Elastic cord in bottom hem provides a quick and secure fit. Tension panels tightly secure cover for highway travel. Built-in strap keepers secure excess strap after tightening. Integrated storage bag. 4 Year Warranty. Lunex ripstop is an advanced, highly durable fabric that uses a grid system to make the fabric stronger and tear resistant. Trailering strap included. Provides UV protection. Elastic cord in bottom hem provides a quick and secure fit. Rear air vent reduces inside moisture and wind lofting. Integrated storage bag and tie-down rope included. 1 year warranty. 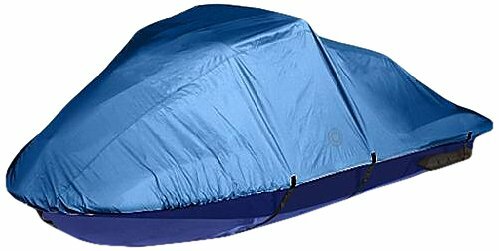 MAXSHADE COVERS® Trailerable PWC Cover is made of marine grade polyester canvas with double PU Coating. 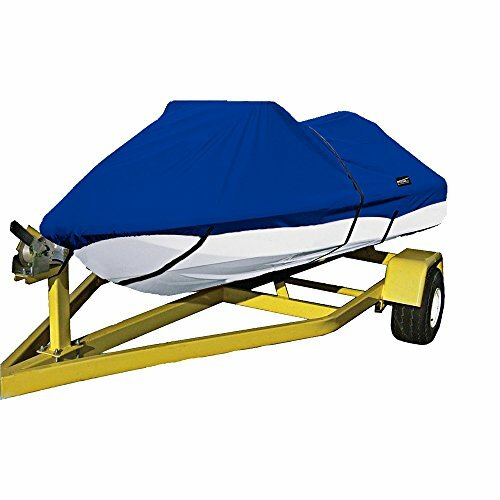 This 300D boat cover designed for both long-term storage, mooring and highway travel. And the mildew-resistant and UV-coated fabric will not shrink or stretch in daily use. With a 1 year manufacture's warranty, MAXSHADE COVER® Trailerable PWC Cover shows more features in cover details and function performance: Adjustable straps with quick-release buckles and elastic cord sewn into entire bottom hem provides a tight and custom fit. ;300D marine grade polyester canvas gives well durability and water resistance; Resistant to mildew and UV damage; A canvas storage bag keeps the cover and straps in a tidy spot when no in use. 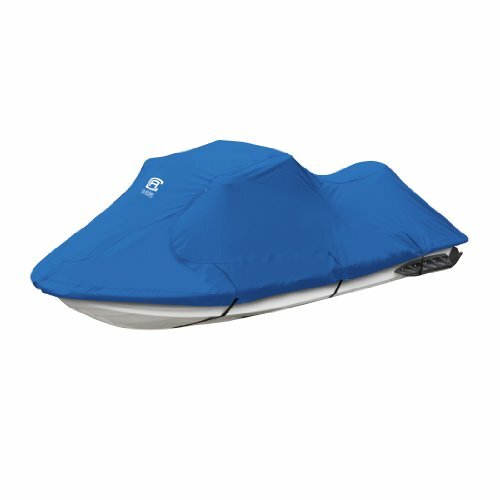 ; Color :Gray, Pacific Blue Available Size and Type: Universal Fit 300D PWC Cover 96-105" （Improved： added 8cm for this cover's width and another 8cm for the length,big enough for covering 96-105" PWCs of the market） Universal Fit 300D PWC Cover 106-115" Universal Fit 300D PWC Cover 116-135" Universal Fit 300D PWC Cover 137-145"
W1 by Wake offers trailerable, all-season, personal watercraft covers that will protect your investment season after season. 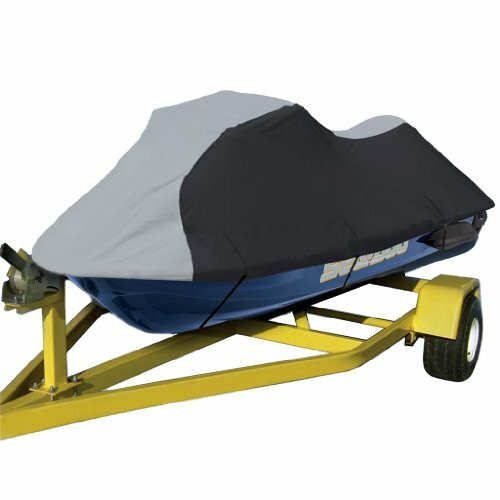 The snug fitting system combined with the ultra rugged Durapel polyester canvas gives your personal watercraft lasting protection from water, sun damage and dirt. 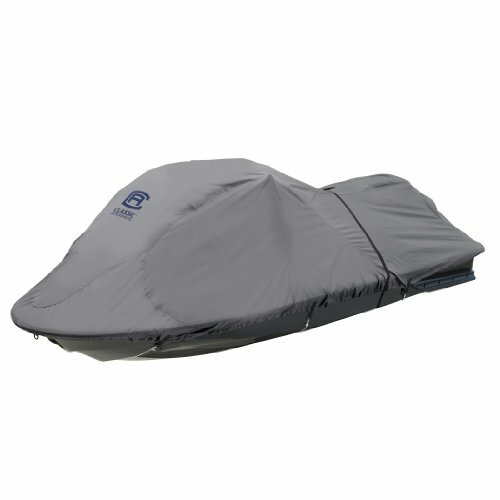 All covers are water repellent, breathable and contain mildew and UV inhibitors for a long, maintenance-free life.